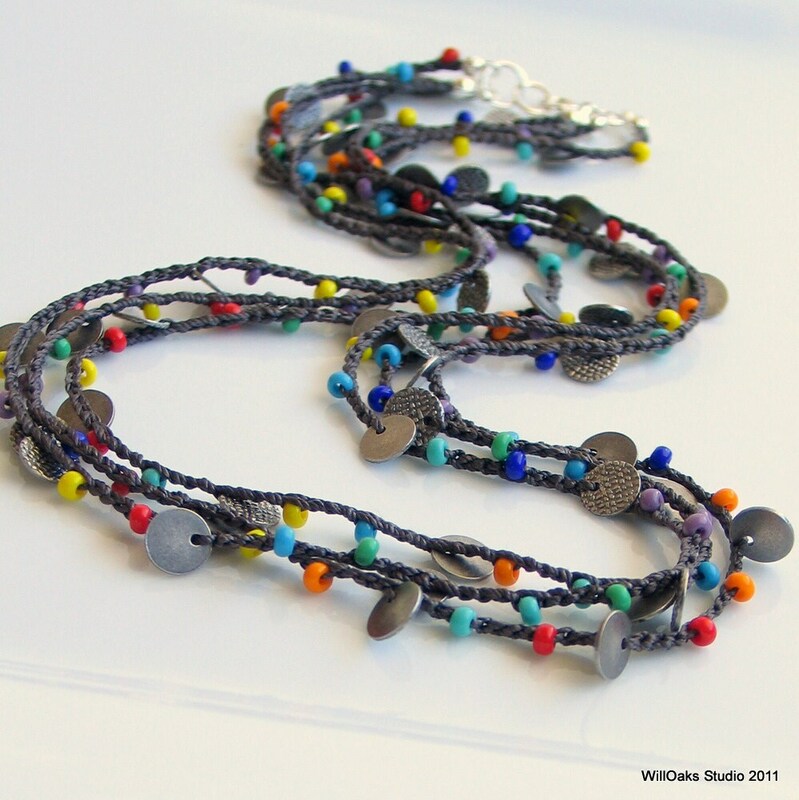 Multi strand crochet beaded necklace or cuff of dark charcoal gray silk captures a rainbow of bright Czech glass beads and textured steel disks in an antique silver finish. 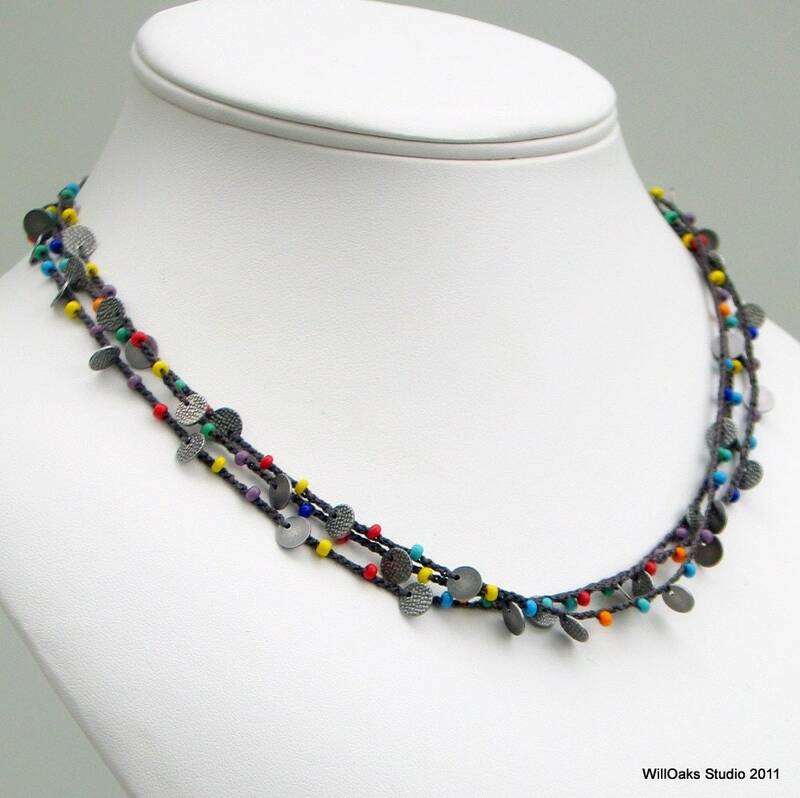 The dark color silk triple strand creation is a 20" long necklace closing with a sterling silver spring clasp. Can be used as a silk wrap cuff where it is dense and rich as the triple strands wrap the wrist 3 times (3x3=9 strands total and just under 7" around). So comfortable as the strong, smooth silk is very light with beautiful drape for a necklace that will work with many necklines and will layer with numerous other pieces, including some of the pieces here in my studio. Worn as a cuff, it's so soft and light you will forget you're wearing it. 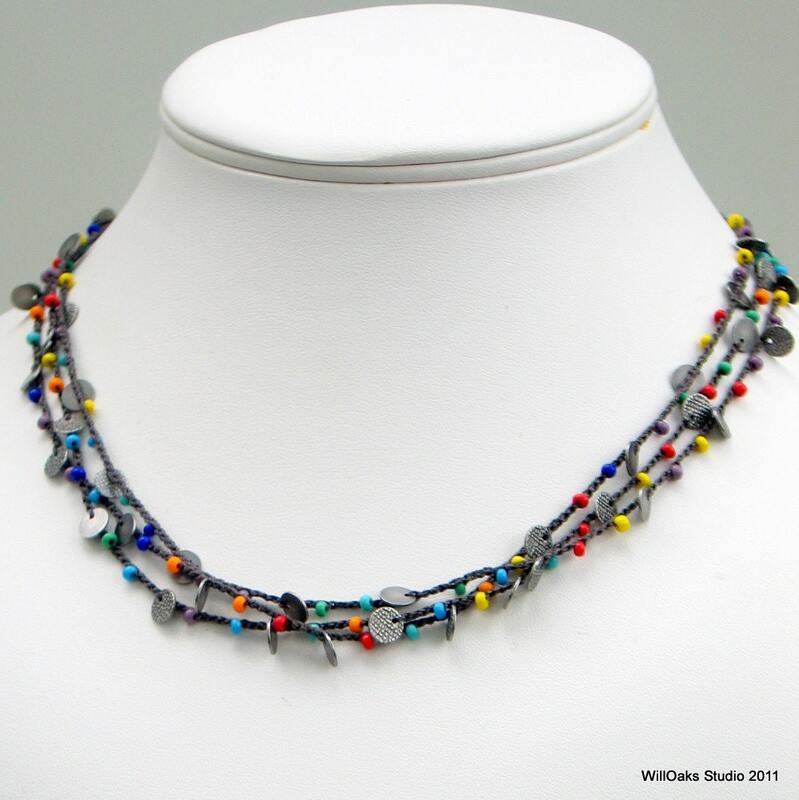 The Czech glass beads are bright primary rainbow tones with a shiny finish. Tiny metal disks about 1/4" or 6mm in diameter are reminiscent of sequins but are finished with a texture that has been antiqued on one side and is smooth on the other. The disks are punched from steel and are plated with antique silver finish. Because these tiny disks are able to easily rotate within the silk chain, they do not poke when worn but rather, lay smoothly and comfortably. 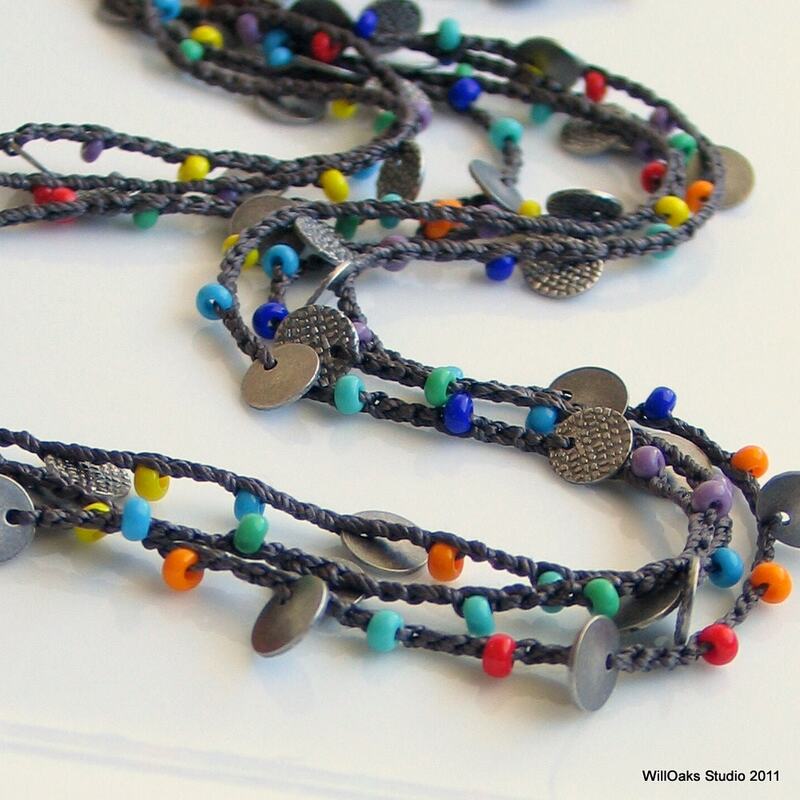 WillOaks Studio "Made With Silk" crocheted jewelry is about to begin the 8th year here in my studio! New designs are regularly developed. Silk chains are packaged in velvet bags for giving and for storage. Adjustments to length are possible when a piece is ordered. For example, with this design, if you plan to wear it as a cuff, please include your wrist measurement in "notes to seller" and I will make length tweaks to be sure a triple wrap can be easily and comfortably done. Thanks for stopping by--please visit the front window of my studio here http://www.etsy.com/shop/WillOaksStudio and please stop by again soon! Made to order. Exceeded my expectations. It was more delicate than I thought but stunning. 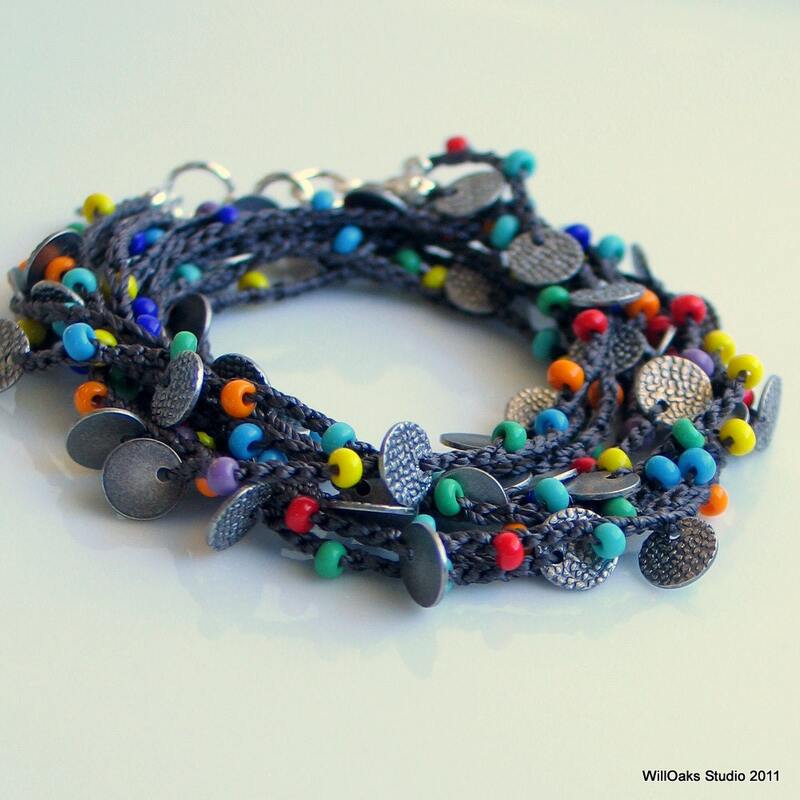 Easily can be worn alone or layered or as wrap bracelet. I'm very happy with it. So pretty, lovely packaging, thank you!